Super-Resolution Radial Fluctuations (SRRF) Imaging is as a novel open-source computational approach to super-resolution Microscopy, developed by the laboratory of Dr. Ricardo Henriques at the Unversity College London (UCL) in the UK. To use SRRF, one should first install ImageJ (or Fiji) and then activate the repository for NanoJ-SRRF, the ImageJ plugin for SRRF imaging. NanoJ-SRRF is part of the NanoJ ecosystem of open-source tools for super-resolution imaging; which also includes NanoJ-Squirrel a tool for error mapping, resolution estimation and minimisation of super-resolution optical artefats in your images (see, Culley et al., 2017 BioRxiv). The paper describing the SRRF technique is found here (Gustafsson et al., 2016 Nature Communications) and instructions on how to get started with NanoJ-SRRF can be found here. SRRF is compatible with live-cell imaging because it can generate super-resolution images from images obtained by sample illumination orders of magnitude less than techniques such as PALM, STORM and STED. More information on super-resolution techniques can be found in (Galbraith and Galbraith 2011 J. Cell Sci) and in this excellent video by Dr. Xiaowei Zhuang (Harvard University), who recently won the 2019 Breakthrough Prize for her work on STORM imaging. 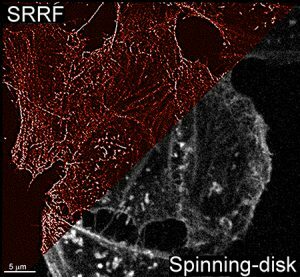 SRRF is capable of producing super-resolution images using data from most modern microscopes including wide-field, point-scan and spinning-disk confocal microscopes. Although SRRF performs well with wide-field images, it is a techniques that improves primarily resolution in X/Y. Therefore, SRRF imaging can benefit from microscopy techniques that provide optical sectioning (e.g. spinning-disk microscopy) or restricted Z-axis illumination (e.g. Total-internal-reflectance fluorescence (TIRF) microscopy). SRRF is compatible with conventional fluorophores such as the Alexa dyes (e.g. Alexa-647 is an excellent SRRF probe) and fluorescent proteins such as enhanced green fluorescent protein (EGFP). For actual image acquisition, 100 frames are taken at 100 Hz (100 frames/s) to generate one SRRF frame. In addition, images ideally should be acquired at or above (i.e. over-sampled) the Nyquist sampling rate for your optical system. As a reference, Nyquist sampling in wide-field microscopy with a high NA lens (e.g 1.4) and imaging at 488 nm excitation and 520 emission (i.e. Alexa488) would require ~92 nm sampling size per pixel. In practice, this would mean that your objective lens magnification, adaptor magnification and camera pixel size must be such that the effective pixel size is 90-100 nm. For example, on my spinning-disk system equipped with a Prime95B camera with 11 micron pixels / 100x objective*1.2 adaptor lens magnification = 0.0917 microns/pixel or ~92 nm/pixel. A handy Nyquist calculator can be found on here on the SVI-Huygens Website. Actual optimal imaging parameters are going to be camera, lens, sample and fluorphore dependent and it is strongly encouraged that you make use of the NanoJ-Squirrel tools in the NanoJ software package to determine the best conditions that produce the best resolution and fewest optical artifacts. In practice, it is better to get as high a signal-to-noise image as possible, even if that means longer exposure times or higher density fluorescent label/staining of your sample. I have found that excellent SRRF images can be obtained at imaging rates of 30-100 frames/s, but images at rates below 20 frames/s will degrade SRRF performance. A recent Twitter discussion initiated by Dr. Paul Reynolds (University of Glasgow) on software imaging parameters for SRRF using Zeiss microscopes and ZEN software can be found here. In the thread there is also some information from Dr. Max Adrian regarding SRRF imaging using Intelligent Imaging Innovation’s (3i) Slidebook software, see here -which is the acquisition software my laboratory uses. WATCH THIS SPACE FOR PERIODIC UPDATES AND TUTORIALS, and KEEP ON SRRFing. ICY: an open community platform for bioimage informatics, from Quantitative Image Analysis Unit at Institut Pasteur, France. FUNDING: Super-resolution Imaging using SRRF was made possible by a Research Tools and Instruments (RTI) grant from the Natural Sciences and Engineering Research Council of Canada (NSERC) and generous support from the Dalhousie Medical Research Foundation (DMRF) via their equipment grant program.